In 2017, an operator of an aggregate plant in Quebec, Canada that produces crushed stone for concrete and construction contacted the local Goulds Pumps distributor. The original pump installed in their process was a rubber lined slurry pump. Unfortunately, this pump was failing after only 200 to 250 hours of operation, resulting in significant downtime, maintenance, and replacement parts costs. The pump manufacturer had not been able to improve the operating life. The short 200-hour life required shut down and replacement of all the wet end components, including the impeller, liners and wear plate. This was costly and unacceptable to the operator. The current pump provider did not have a solution to extend the operating life. After several attempts to extend the life with the current pump the plant manager contacted the local Goulds Pumps distributor to see if Goulds Pumps could offer a solution. 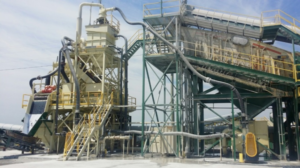 This crushed stone plant needs to operate continuously during the construction season from April through October. The goal was to provide a pump that was capable of operating the entire season without repair. The local distributor along with the Goulds Pumps slurry product manager visited the plant to review the installation, including the application and the actual crushed stone being pumped. They determined that using an all rubber lined pump was not appropriate for this service. While the majority of the stone was very fine, there was a percentage of these solids that were slightly larger and sharp, which can present a problem for rubber. Since the operator requested the most cost-effective solution, a rubber lined pump with a hard chrome iron (HC600) impeller was offered and installed. This arrangement was offered because if the rubber proved to be ineffective, the Goulds XHD can be changed to all chrome iron by simply changing the liners and impeller. This was very attractive to the customer. Furthermore, due to the XHD’s short robust pedestal, the XHD could be adapted to the existing foundation with no modification to it. This allowed the operator to match the centerline of the suction piping, greatly reducing installation costs. The XHD provided 4 times the life of the previous pump. While this was a significant improvement, it did not meet the goal of operating the entire season without repair. However, upon examination of the pump and system the operator found that only the suction wear plate needed to be replaced. The impeller and liner had little wear. ITT Goulds Pumps also determined that the suction velocity was low, which allowed settling of the solids. This caused increased wear at the entrance to the pump thus reducing the life of the wear plate. The customer was so pleased with the XHD ’s performance that instead of retrofitting, they purchased a second XHD in all chrome iron and relocated the existing rubber lined pump to another location. They also changed the suction pipe from corrugated pipe to HDPE pipe to improve the suction conditions. Both the metal and rubber lined pumps have operated successfully the entire season. 3. Goulds Pumps XHD with interchangeable rubber and metal wear component. This case study is provided by ITT Goulds Pumps.